Please note that all adult passengers must purchase a Kakadu National Park Ticket, which is compulsory whilst travelling within Kakadu. This ticket is valid for 14 consecutive days of travel. Tickets can be purchased on the morning of the tour before departure. 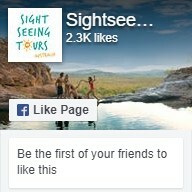 This tour only operates during the dry season (April – October). If you are interested in travelling outside of these months, check out our 2 Day Kakadu Wet Season Tour, which operates November to April. Sleeping bags may be hired for $10 to be paid on the day of your tour. Please let us know when you book if you require a sleeping bag. 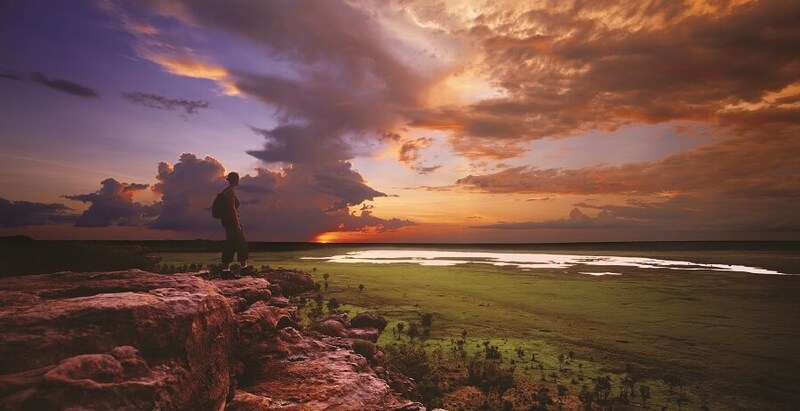 No matter what time of year you visit Kakadu, there is always something to do. The dry season runs from May to October and at this time of year most visitor sites are open. The wet season extends from November to April and brings green landscapes, flooding and the chance to explore with fewer visitors. 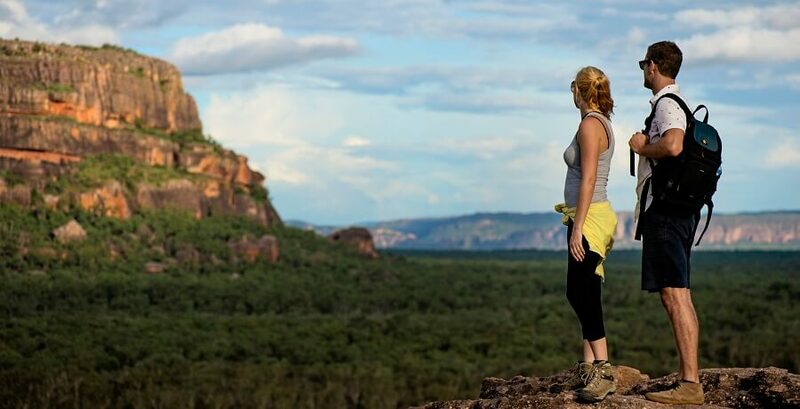 This 2 Day Kakadu 4WD Safari runs from March – September an offers 2 full days of hiking, swimming, waterfalls, bush walking, exploring and enjoying the wonder of Kakadu National Park. Due to the nature of the weather and the changing seasons in Kakadu and its effects on the road access in the area, itineraries can vary for each tour departure. No matter the itinerary however, we offer handsdown the best 2 Day Kakadu 4WD Safari experience available and all that at a great price. Pickup is at 7.00am from your accommodation in Darwin. The Corroboree Tavern has been around since the 1980’s and is a must do on your outback experience. The Tavern is home to crocodiles, buffalo and other exciting animals. You may even get the chance to meet ‘Fred the Freshy’ and the park’s main star, ‘Brutus the Salty;’ a four-meter Saltwater Crocodile. The Bark Hut Inn is a popular tourist destination for travelers on their way to Kakadu, or other regions close by. It serves as an ongoing reminder of the success, built from the Australia Buffalo Industry and the willpower of the brave men and women, who pioneered the Outback in the 1960’s. 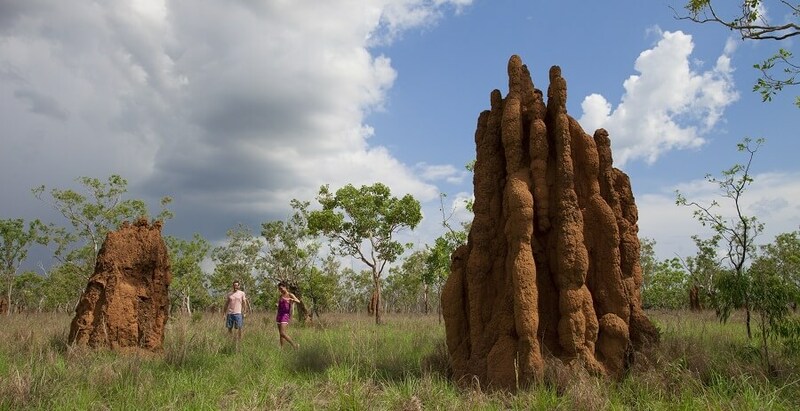 The Magnetic Termite Mounds are situated in Litchfield National Park. Take a walk along the boardwalk and witness these breathtaking architectural masterpieces, ranging between 2 and 4-meters high. These astounding structures are built by termites and feature chimneys, tunnels, arches, insulation and nursery chambers. These structures are over 100 years old and are only found in the Northern parts of Australia. 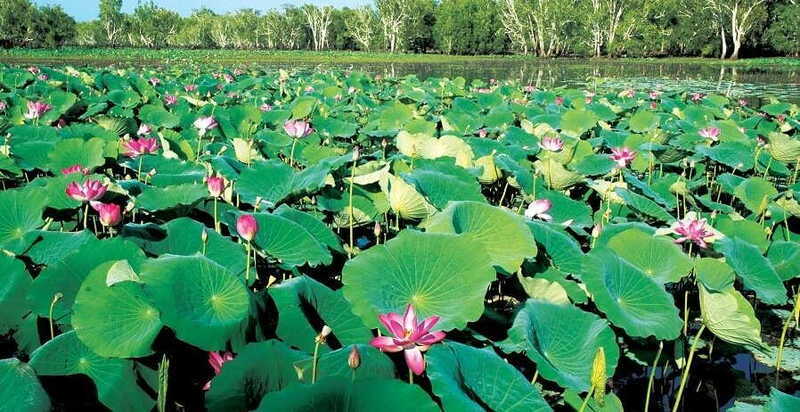 White Lilly Billabong is just off Jim Jim Road and is home to a vast variety of birdlife. Enjoy a picnic lunch along the banks of the Billabong and keep that camera close by, as we will witness some of Kakadu’s most exotic birdlife. Maguk (Barramundi Gorge) is located an hour’s drive from Cooinda. Located amongst the World Heritage Listed – Kakadu National Park, it is home to stunning plunge pools and Anbinik Trees. Enjoy a 2km hike around the falls and upper reaches of the Gorge. It is a superb spot for swimming and exploring. Nourlangie showcases 20,000+ years of aboriginal art, culture and history. We will go on a 1km hike through this sacred area, whilst learning about the Dreamtime and Mythology of the Aboriginals, the traditional owners of the land. Kakadu National Park is home to one third of Australia’s bird species. Experience this abundant birdlife, with a sunset nature walk, followed by a drive to Jim Jim Campground, where we will call home for the night. Set up camp and get nice and comfortable, before tucking into our BBQ dinner. Broaden your taste buds, as Buffalo sausages and Kangaroo Stir-fry, will be on the menu. Nourlangie is one of the most popular Rock Art spots in the National Park and is home to hundreds of colourful paintings of animals, people, and weapons, drawing out a fascinating narrative from thousands of years ago. Nuwurlandja Lookout, is situated next to Nourlangie Rock and is the perfect location to view spectacular lightning storms, after a 600m climb to the top of the lookout. Ubirr is a magical place, home to Aboriginal Rock Art. Drawings, dating back several thousands of years, illustrate animals such as barramundi, catfish, mullet, goannas, long-neck turtles and much more. 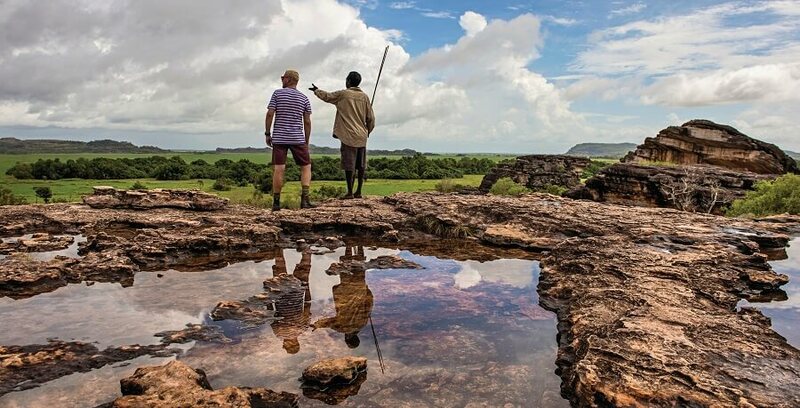 From the peak of Ubirr Rock, experience panoramic views over the floodplains and escarpments. Warradjan Aboriginal Cultural Centre was developed by the traditional owners of Kakadu. The Centre displays many artefacts, dating back thousands of years. Learn what ‘bush tucker’ is and maybe even purchase a traditional Didgeridoo or some local artwork at the gift shop (own expense). Experience a full day hike through the monsoonal rain forest, ensuring that you will be able to experience the wet season in its full glory. Discover Boulder Creek and Kurrundie Creek rich in exotic wildlife and bushtucker. 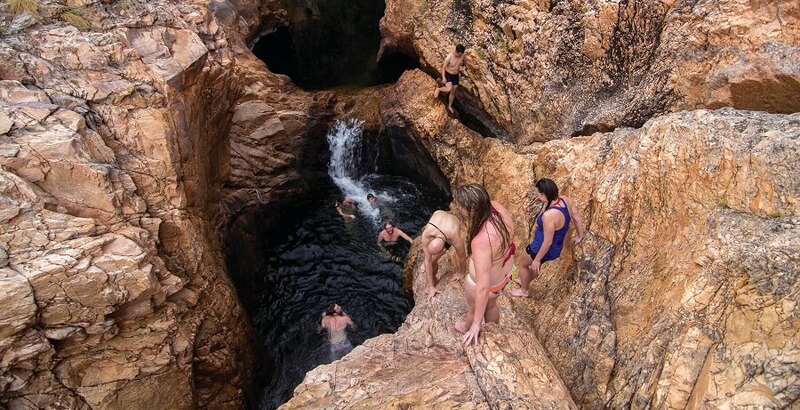 Take a dip in Kurrundie Creeks fresh flowing waterfalls and feel totally rejuvenated. Named after the nearby Bowali Creek, The Bowali Visitor Centre is situated amongst Kakadu National Park. Watch a 25-minute audio visual presentation, to help you gain a greater understanding of Kakadu, its land and its history, then take a walk through the interpretive displays. Return to Darwin approximately 6pm on Day 2.